want to share some of your dinner party menus with me? I miss the slumber parties of my youth. I was the kid who had slumber parties all the way through high school. After the boys left, the girls and I would stay up all night long talking about the boys who had just been there, daring each other to do stupid things, and laughing until it hurt all night log. No one really has slumber parties as an adult. At least not the kind I am thinking of. I don't blame us though. The older we get the less willing we are to sleep on someones hard wood floor for fun. Our backs just can't handle it and we need more sleep than we used to in order to be sane the following day. So, as adults we have to dress up the slumber party. We have to have dinner parties from time to time that are free from the Y chromosome carrying half of our species. I wanted to have my Northwest friends over for dinner and drinks and I wanted it to be the type of event where all they had to do was show up. I didn't want to ask anything of them. I just wanted them to come over, be my guest, and hang with me. I didn't quite make it through to the entire menu I had planned. I was on my feet the whole day, so much so that my feet were sore and swollen like a pregnant ladies by the time I went to bed. One item didn't turn out servable at all. I spent the morning shopping and the rest of the day cooking. I had one of the best days ever. For me, it does not get much better than spending the morning at the farmers market, the entire day cooking, and finishing up just in time to laugh uncontrollably for an entire evening with some of the best women around. 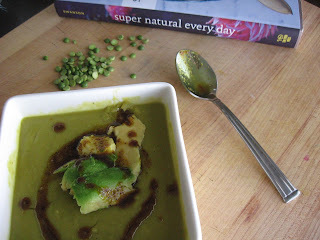 It was all delicious (with the exception of a failed experiment with a new avocado soup...no need to ever mention it again). I do wish I could send a plate your way. Instead I will just have to share some recipes and photos with you. There are a lot of recipes here...so feel free to just scroll through and look at the pictures. 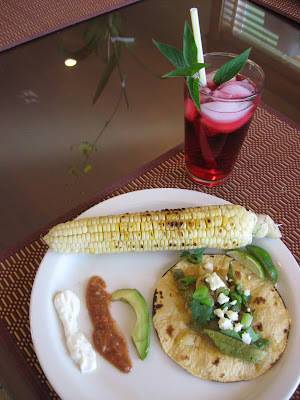 This was adapted from a recipe for hibiscus juice from Gourmet. I just couldn't resist turning it into something more sinful than juice. I used pineapple sage simple syrup to make the drinks last night, because it was what I had on hand. However, any simple syrup will do. I made these in a shaker, but if you don't have one, just halve the recipe and make it right in the glass. Fill two pint glasses and shaker to the top with ice. Place gin, simple syrup, and hibiscus juice into the shaker and shake vigorously for a few seconds. Divide the mixture between the two pint glasses then finish each one off with about a quarter cup of tonic water. Throw the straw in and give it a quick stir. Soak the hibiscus flowers in water for at least four hours in 3 c. water. To get the most flavor out of the flowers soak them for at least 8 hours, or overnight. Once they are done soaking strain the flowers out and pour the liquid into a pitcher. Add the remaining water. If you are just going to serve this as a juice, go ahead and add a cup of sugar as well and stir. My pineapple sage plant is an overachiever. I haven't been sure what else to do with it this summer other than use it in simple syrup for making drinks. There could be worse fates. You can of course just omit the pineapple sage if you are without, or substitute mint or even ginger. I made these in a shaker, but if you don't have one, just halve the recipe and make it right in the glass. Fill two pint sized glasses and the shaker to the top with ice. Pour the vodka, simple syrup, an cantaloupe juice into the shaker and shake vigorously for a few seconds. Divide the mixture evenly among the pint glasses then top each one off with about a quarter cup of club soda each. Throw the straw in and give it a quick stir. Cut a ripe cantaloupe into larch chunks and discard the skin. Blend the cantaloupe and 1 1/2 cups of water in batches in a blender. Line a colander with a kitchen towel (not terrycloth) and place it over a large bowl. Pour the cantaloupe puree into the colander and allow it to sit for at least an hour. After an hour pick up the edges of the towel with one hand and use the other to squeeze out any remaining juice. Then squeeze in the lime juice. Place all ingredients in a sauce pan and cook over medium heat. Continue to stir until all of the sugar dissolves and it has just begun to boil. Remove from heat and allow to cool. Simple syrup will keep for about 10 days in your refrigerator. 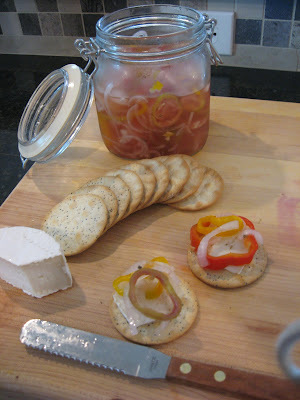 This pickling recipe is from Orangette's column in the magazine Bon Appetit. The colors of the peppers were so beautiful, I had to make them myself. The original recipe calls for shallots, fresh thyme, and white wine vinegar. I had none of those, but my guests loved them anyway. The seven of us at the entire jar in about an hour flat. 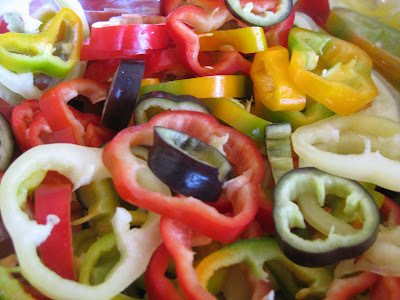 Put the sliced peppers and onions into a large bowl. Place everything but the onion and sweet peppers into a sauce pan and cook over medium heat stirring occasionally. Bring it to a boil and once the sugar has dissolved completely, pour it over the sweet peppers and onion. Cover and let it stand for five minutes. Then remove the cover and let it stand until it reaches room temperature. Once it reaches room temperature squish the entire mixture into a quart sized jar and refrigerate it for at least four hours. The peppers should keep for up to 10 days in the refrigerator. Serve with crackers and cheese. These tacos are great for a dinner party because they come together quickly and your guests will be impressed by your use of cactus. Nopales, or cactus paddles, can be found at Mexican and specialty super markets. The corn that I served with dinner I just covered in butter, salt, and pepper and cooked on a cast iron grill pan. 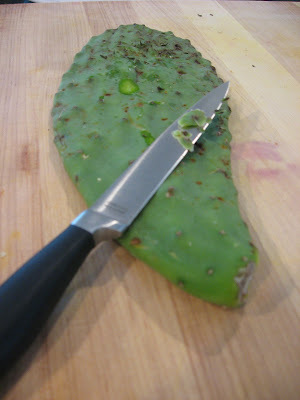 To prepare the nopales, rinse, and then hold with one hand by their bottom and use your other hand to run a knife down it to remove any needles and other rough spots. then slice it horizontally into half inch thick slices. Put two Tbs. of extra virgin olive oil in two medium sized saute pans over medium -high heat. Put the nopales in one pan and the onions in the other pan and season both pans with salt and pepper to taste. After five minutes add the zucchini to the onions and continue to saute both the nopales and the vegetables until they are cooked through and beginning to brown, about another ten minutes. While the vegetables are finishing up cook the tortillas. 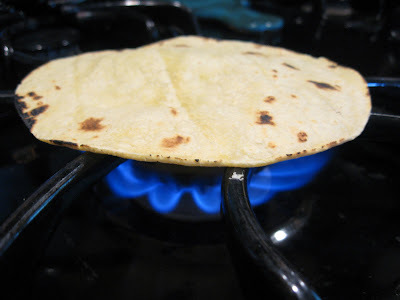 If you have a gas burning stove turn on a burner to medium-high heat and place a tortilla directly on a burner. Use tongs to turn it over after about 10 seconds (or when it starts to brown) and let it cook on the other side for the same amount of time. When you remove it from the burner place the tortilla on a plate under a kitchen towel to keep it warm. If you have an electric stove, heat a frying pan with 1 Tbs. vegetable or canola oil. Once the oil is hot place a tortilla into the pan and cook it until it begins to brown, then flip it to cook the other side. Serve the tacos buffet style with all the tacos, fillings, and toppings laid out for your guest to pick and choose. Heat the olive oil over medium low heat Once the oil is hot add the onions and a pinch of salt. Continue to cook slowly, and stir occasionally. After about 15 minutes the onions will have turned a golden translucent. Add the garlic and cook for another two minutes. Place the saute along with all the other ingredients, with the exception of the lime and salt, into a food processor and blend until there are no large chunks left. Taste the salsa and add salt to taste and squeeze in the lime juice. Blend quickly and taste one more time for salt. Store in the refrigerator until you are ready to serve it for a few days. This pie was really good. It was not overly sweet like many pies are. For perhaps an even more decadent version head over to Sassy Radish for a Bourbon version. 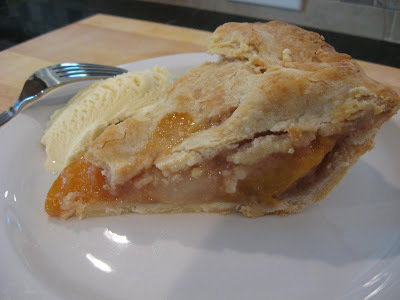 Also, if you are willing to head to the farmers market the day of, you can get some really good deals on over-ripe peaches that are perfect for pie making. Place a large pot of water over high heat and bring it to a boil. Then make a large bowl of ice water and put it next to the stove. Rinse and cut an X in bottom of each peach. Once the water is boiling place the peaches in batches into the boiling water and remove with tongs or a slotted spoon after 15 seconds and place in ice bath (to stop the cooking). This will blanch them and make it easier to remove the skins. If you don't mid the skins, you can skip this step. Toss the peaches along with cornstarch, flour, cinnamon, and salt as well as squeexing the half lemon to juice it, in a large bowl. Place a foil-lined large baking sheet (with edges) in lower third of oven and preheat oven to 425°F. To make the caramel, place a 1/2 cup of the sugar, honey, and water in a small to medium sized heavy saucepan over medium-high heat, stirring until it has reached a boil and the sugar has dissolved. Continue to boil the mixture without stirring, but instead swirling the pan occasionally so that the caramel colors evenly. After about five minutes, the caramel will be dark amber in color. Remove the pan from heat and add the butter, swirling pan until butter is melted. Pour evenly over the peaches and toss (caramel may harden slightly but don't worry, because it will melt again in the heat of the oven). Keep the pie dough in the refrigerator and remove them one at a time for pie assembly. Roll out 1 piece of dough into a 13-inch round on a lightly floured surface with a lightly floured rolling pin. Fold it into quarters and lift it into a greased, 9-inch pie pan and then unfold it again. Roll out the second piece of dough into an 11-inch round on a lightly floured surface with a lightly floured rolling pin. Transfer the peach pie filling to the pie pan and then place the second piece of dough on top. Trim the edges of the bottom and top pieces of dough and pinch the edges together by hand, or with a fork. Brush the top with the milk, then sprinkle with the remaining Tbsp sugar (the sugar is optional). Cut 6 steam vents in top crust with a knife. Place the pie on the baking sheet you put in the oven earlier and bake for 20 minutes. Then reduce the oven temperature to 375°F and continue to bake the pie until the crust is golden-brown and the filling is bubbling, about another 50 minutes. Labels: appetizers big dinner party this saturday with my ladies and lot's of good food cocktails Recipes want to share some of your dinner party menus with me? I loved sleep overs! Once my girlfriends even stayed over 3 days straight - we loved it. Well done on hosting a dinner party with so much food! Three days sounds like the MOST FUN EVER! I'm jealous. What a lovely menu. Everything sounds delightful. Quick question: I've always wondered, I have a bunch of little cactus growing in my backyard. Is it edible? Can I cook with it? It looks like the one pictured in your post.